COPYRIGHT: All photos on this and my other pages are copyright . However use for any non-profit purposes can be had in most instances by simply E Mailing first. It was the last week of my holidays. I had hoped to chase on a few days, but unfortunately a huge winter like high pressure had parked itself over southern Australia for several days on end. This blocked cold fronts and kept trough systems back in Western Australia. In the end on Thursday ( 23rd October ) with less than 4 days before I had to return to work I decided on a trip to the Northern tablelands of New South Wales regardless. Normally at this time of year there can be several severe storm days in this area. My trip storm wise was looking miserable, stable high pressure and no forecast of storms until at least Monday or Tuesday. I consoled myself that this was going to be gemstone and wildflower hunting trip. And certainly on Thursday and Friday that's exactly what it was. I had based myself at the town of Glen Innes, about 1000 metres ( 3000ft ) above sea level, and on the Great Divide itself. Friday did show some scattered cumulus, which led me to be a little more optimistic about Saturday than official forecasts. 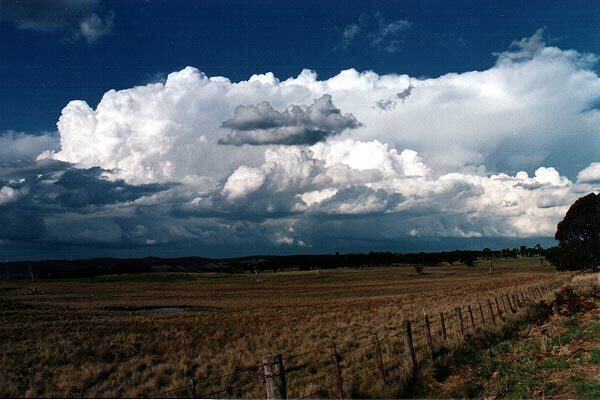 Forecast that night had only storms for the far NW of the state, about a five hour drive from Glen Innes. Saturday morning revealed some early fog lifting into small cumulus, more promising was some early middle layer altocumulus as well. I knew that nothing would happen before lunch. My decision was do I get in the car and head west out onto the northwest plains where at least storms were forecast, or do I stay on the tablelands were no action was forecast, but if something did develop it would have better potential for being severe. I decided on staying on the tablelands. I killed the morning with an 80 kilometre ( 50 mile ) drive east to the world heritage Washpool National park, which features several rainforest habitats depending on altitude. At lunch time I returned to Glen Innes. By now healthy cumulus was covering 75% of the sky. But nothing was happening, the potential was there, but it just wasn't going anywhere. I decided that moving 50-60 miles westwards, off the tableland and onto the slopes would be a better option. That way I could check the potential both eastwards ( back towards Glen Innes ) and westwards, where it was much warmer at 30C ( 86F ). The view from the sapphire mining town of Inverell was not looking good for either direction. The only fully developed storm was a long way off to the W/SW, I estimated in the vicinity of Coonabarabran. I decided to track southwards which would take me closer to this storm, but at the same time kept me in touch with the tablelands. At the small town of Bundarra I decided to haul eastwards up onto the tableland again as at last there was a cell getting into motion. A check of the road map revealed a minor 'secondary' road from Bundarra at 660 metres ( 2000ft ) altitude, to Guyra at 1300m ( 4300ft ) altitude. Right from the first kilometre I knew this road was indeed ' secondary '. It was a dirt road that was that infrequently used that grass grew down the middle of it. It was 69 kilometres ( 40 miles ) long. Thank goodness I own a four wheel drive, at least I knew that the suspension was better able to cope with the potholes. Anyway it took over an hour the negotiate the 69 kilometres, which included several slowdowns for animal life, several kangaroos, some cattle, a calf that decided my truck was its mum and a mob of sheep. At Guyra and back onto to bitumen revealed that out of all the earlier cumulus only one cell had become a fully fledged storm. This storm was I estimated about 30 minutes from Guyra, and best of all right up the state hwy, not some farming track. At Ben Lomond ( yes, the Northern Tablelands does have an affinity with Scottish names ) I caught up with the storm. I had to punch through the storm to get to the NW side, which would the side any action would develop on. I was not particularly worried as there were no signs of severity. I was surprised that I ran into hail, about pea to marble size and quite thick. This was very helpful in cleaning off four days of accumulated bugs on the truck. As soon as I got past the hail I pulled over and watched for about 45 mins as the storm basically fell apart. On the Northern Tablelands farmers storm index it would rate a " what storm ! " Of course when I returned home the next day the area had two days of severe storm warnings.